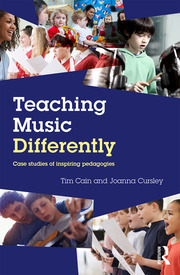 Tim Cain is Professor in Education at Edge Hill University. Prior to this he was a Secondary School music teacher for 19 years and a Teacher Trainer for 12 years. For nineteen years, I taught music in four Secondary schools, before moving into teacher education. I taught at LSU College, Chichester University, Kingston University, Bath Spa University and the University of Southampton. In 2011 I moved to Edge Hill University as Professor in Education. Here, I direct the research centre for Schools, Colleges and Teacher Education (SCaTE) and teach research methods on undergraduate and postgraduate programmes. I have always been fascinated by teaching and teachers and I have a particular interest in the relationship between research and school teaching. My work in this area has appeared in Croatian, Dutch, German, Italian, Spanish, and Slovene publications and I have given Keynote Addresses to conferences in Belgium and Croatia. PhD, University of Southampton, 2006.